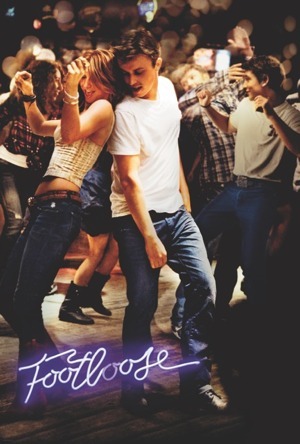 “Footloose” danced its way into my favor by making significant changes to the 1984 script that were gravely overlooked and by adding new situations. The diversity of the cast, better choreography and the toning down of Rev. Shaw’s (Dennis Quaid) sermons all helped create an entertaining film that moves along at just the right pace, never loosing it’s footing. One minute the film resembles the look of the TV show, “Friday Night Lights,” as all the townsfolk know each other’s business; the next, a segment of “Dancing with the Stars,” another popular TV show where audiences are wooed by eye-popping dance moves. Either way, the mix of the two and added drama all works to create a hip-hop, barnyard, toe-tapping hootenanny that delivers exactly what it set out to do. The 1984 film stars Kevin Bacon as Ren. In the 2011 film, Ren is played by Kenneth Wormald. The character is a teen from the big city who comes to live in a small town under the thumb of a strict city council who implemented rules that include no dancing, after a group of five teens were killed in a tragic car accident after attending a dance. Of course, you’ll want to know if Wormald is as good in the re-boot as Bacon. Yes and no; Wormald is a much better dancer whereas Bacon is better in the acting department. I’d say that director, Craig Brewer, missed several opportunities in his direction of Wormald’s Ren. First, he’s too smiley in certain dramatic scenes. (The same was true of the heartthrob Robert Pattinson in “Water for Elephants.” Both characters have lost their parents and needed to be more subdued not overly smiley). Secondly, Ren’s Boston accent was inconsistent and in some occasions it got in the way. Ren is the central character, as well as the preacher’s daughter, Ariel, played by Julianne Hough. Ariel has been dealing with her brother’s death as he was one of the students that was killed in the crash. She loves to dance and clashes with her strict father. She ‘sows some wild oats’ in rebellion and dates the town’s bad guy. When she breaks up with the goon, they have a dramatic fistfight that ends in preacher dad slapping her as well. Thankfully, this issue was brought to the forefront and dealt with empathy for the victim, as in the 1984 version Ariel donned two black eyes in several scenes and nothing was said about her abuse. Another major change in the film is in the beginning, we see the car crash so we know from the get-go why the town has demanded the no dancing law. In the opening scene, Rev. Shaw (Quaid) preaches an emotional sermon with tears in his eyes, as he talks about the deaths that occurred, including the death of his son. He’s believable and feels strongly that he must protect the other children in the town of Bomont, GA., pop. 19,000. Ren’s aunt and uncle are more supportive than in the first film, especially his uncle who gives him a yellow VW Beetle car to fix up. There’s something about teen boys and their cars that gets to me every time. My sons had a ‘95 red Mustang convertible in high school and they were in heaven every time they were tuning it up or adding new speakers, etc. The addition of Ren fixing up the VW while a heavy metal song (“Bang Your Head” by Mental Health) blared in the background was pitch perfect. No oversized boom box. This time, an iPod is used to crank up the music as it’s connected to the car’s speakers. The updated version talks about grass-fed beef and the choice of being a vegan for standard family dinner discussion. The drag racing old school bus scene was also better as an announcer could be used instead of the country dirt road in the middle of nowhere, with few spectators. My favorite scene was at the end, the school dance where all the townsfolk worked together to clean up an old dusty building and add the decorations including a disco ball so the kids could have a good time. The dancing was infections and the song ‘Footloose’ was the crème de la crème. Bottom-line: A better film than the first, delivers what it sets out to do and more. The new soundtrack is great, especially, ‘Walkin’ Blues’ by Cee Lo Green and featuring Kenny Wayne Shepherd, Blake Shelton’s version of ‘Footloose’ and ‘Fake I.D.’ by Big & Rich featuring Gretchen Wilson. Cast: Kenny Wormald (Ren), Julianne Hough (Ariel), Dennis Quaid (Rev. Shaw), Andie McDowell (Vi), Miles Teller (Willard) and Ziah Colon (Rusty).